Clement Phinney was born in Gorham, Maine. In his teen years and early 20s, perhaps no one, least of all Clement Phinney himself, imagined he would become an evangelist. His biographer describes him as very worldly, attempting to stifle the voice of God by living in sinful pleasure and ridiculing sacred things. 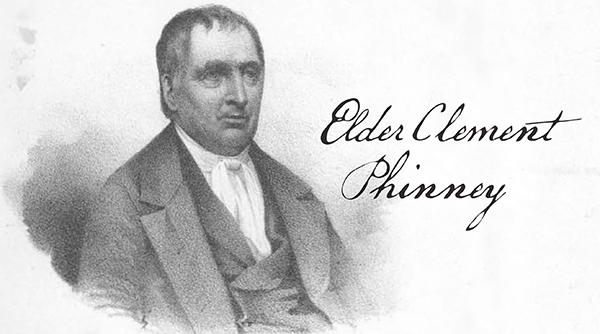 Phinney was converted in 1806, however, and gave himself to full-time evangelism nine years later. In 1851, D.M. Graham, pastor of the First Freewill Baptist Church, New York, wrote a biography of Clement Phinney. Some incidents Graham recorded give interesting sidelights into Phinney’s life and conduct. Phinney declared himself a “born” Free Will Baptist. When the boy was drilled in the catechism as a youngster, one day he disagreed with the answers on the decrees of God. His mother was deeply shocked, but Phinney believed in free will and free salvation before and after his conversion. As a young man, he heard an unidentified elderly man preaching free salvation and decided that was the doctrine for him. When he joined the church, he dedicated himself with conviction to the Free Will Baptist position. He must have been a wise man with a keen sense of humor. At 60 he told several fellow ministers that he feared that he, if not already, would soon become childish. “But if I must be a child, I will do the best I can to secure good tutors and governors,” he said. He then proceeded to choose three ministers as his governors and never forgot to remind them of their responsibility.